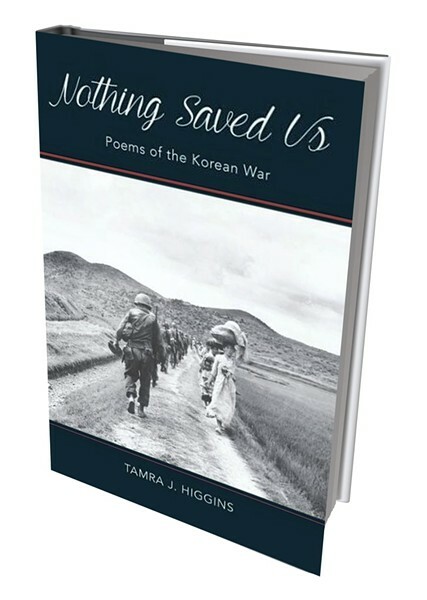 Nothing Saved Us: Poems of the Korean War by Tamra J. Higgins, Sundog Poetry Center, 94 pages. $15.95. OK, sometimes you can judge a book by its cover. And in the case of Nothing Saved Us: Poems of the Korean War by Tamra J. Higgins, you should. Its black-and-white cover photo shows U.S. soldiers, rifles slung over their shoulders, headed into the hills, and Korean refugees, their possessions balanced on their heads, headed out. That contrast is a perfect synopsis of the book's simple, devastating structure and content. Higgins' debut collection starts with a series of narrative poems about an American going to war that pace single file into the heart of the book. They portray an Iowa farm boy through his training and deployment in the Korean War, followed by his injuries and homecoming. In an apt counterpoint, the book ends with a refugee mother's testimony delivered in a series of sijos, a Korean poetic form. Higgins is president of the Poetry Society of Vermont and founder of Sundog Poetry Center in Jeffersonville. Her meticulously executed book was born out of two years of interviews she conducted with her father, Wayne L. Case, who served in the Marines in Korea from 1952 to 1953. Through three-quarters of the collection's 21 poems, the voice of Higgins' father, Private First Class Case, dominates the narrative, his unmistakable vernacular clicking like bullets into the stanza's chambers. For instance, the young man's voice relates: "Jackson ended up getting hit through the elbow up to the shoulder, but those bullets never bit his bone. Happy with his great big scar, he knew it was worth free beer back home." The above is part of the volume's "War Games," numbered prose poems trimmed with sly rhymes — as in "One Marine was given the choice of Pendleton or prison. Maybe that was why he always grabbed his gun and sprayed the room for fun." These anecdotes pop up in groups, interspersed with pages of orderly verse, perhaps simulating the way chaos and shenanigans interrupted the rank and file of a GI's life. While these stories could be almost any war's stories, the voice belongs exclusively to a farm-bred kid, one used to rearing and slaughtering. Hence the matter-of-fact treatment of death and dismemberment in "Sandbag (July 4, 1952)": "We slogged along all afternoon until / from in the earth I heard Frank's flood of curses. / I wondered if he'd chopped through his own foot. / It wasn't that. He'd only been surprised: / a hand that he'd dredged up laid at his feet. / One of ours, or one of theirs? It didn't matter." The disembodied hand in this poem (ours? theirs?) becomes an emblem of all those who "have a hand" in this book — or a voice. They go beyond Wayne Case and his daughter, who has done the grunt work of turning her father's testimony into verse. The reader also encounters other "contributors" to the war narrative, such as a platoon of men out on patrol. At last, toward the book's end, we hear and bear witness to the perspective of one whose country has been torn apart. In her final pages, Higgins channels the voice of a Korean widow who is moving through her broken memory and shattered country. Over the course of 26 stanzas, the unnamed female narrator describes leaving her home, surviving in a refugee camp and immigrating as a bride to the United States. Compared with the straightforward, laconic voice of Private Case, this voice is more delicate: "Where is Father? Where are you, Grandmother? / Fifty years without a word; / you do not know daughters; sons have grown / while armistice hangs on. / Land mines hide behind a line. Barbed wire / still punctures the view of you." Higgins' verse bravely faces the danger inherent in speaking for other people as she reaches for a way that isn't a contrivance or an appropriation. Though the poems told from the widow's point of view aren't as familial as those portions containing Higgins' father's testimony, they offer readers a beautiful, necessary countervalence to the soldier's story, and thus complete the circle of experience, impact and loss. Articulated throughout the book, this sense of war as a shared sorrow and scar is embodied in its title. Initially, Nothing Saved Us may seem like a smart retort to all those book titles professing to introduce us to things that will save or improve us (e.g., The Town That Food Saved, How Proust Can Change Your Life). But Higgins' "nothing" is a palpable absence and a repeating motif in the collection. We see it in the clever plan a soldier makes that "the other men grabbed / hold of, having nothing // else to wrap their arms / around" ("Conveyance"). We see that "nothing" again in the discharged veteran's phantom limb, and in his expulsion from jobs and homes: "'What! Lost your job again?' she said; and cried /...while at the door, eviction hissed." ("Purple Heart Recipient"). In the title poem (see sidebar), "nothing" has a deeper, ironic meaning: It's actually a something, the hollow core of the circle that the soldiers have formed on a hilltop. In this naked place, a North Korean grenade lands, miraculously sparing all the men wreathed around it. Higgins' collection embraces both the havoc and the humanity of her father's experience of the armed services. What she offers her readers is an act of listening to another person not just adequately but eloquently. The full text of Nothing Saved Us, which Whittier College in California is using as a text for a Documentary Poetry course, includes a spectrum of supplemental material not usually found in a book of poetry. Bringing the war home to those who may be less familiar with it, Higgins has included black-and-white photographs (drawn from both her family's collection and the Associated Press), a glossary of terms, an extensive reference section for further reading, a generously orienting preface and historical endnotes. Finally, she provides an introduction to the sijo, a traditional Korean form of poetry that could be seen as an elaborate cousin to the better-known haiku. Giving voice to the opposing perspectives of citizens from two countries, with this slender, ambitious volume Higgins begins another form of armistice. when the shell dropped in. For fifty years, I've thought of it.